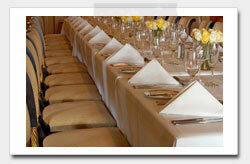 No matter what the occasion, a good banquet is always remembered. Whether you are hosting a family reunion, office party, religious celebration, or just looking for an excuse to party with your friends, you will find that Asheville Hwy Rentals offers almost everything you need to have a great time. If an outdoor event is in your future, don't worry about the weather. At Asheville Hwy Rentals, we have all the equipment necessary -- climate controlled tents complete with elegantly set tables, professional lighting, and everything needed for a fully stocked buffet. Our extensive selection of banquet and party equipment will ensure that your guests talk about your event for a long time to come. Click here to view our entire catalog of event and banquet equipment rentals in Spartanburg SC or use our search feature to find the items for your special event!